After a super long and extremely stressful week, there was nothing I wanted more than to eat good food while hanging with great friends. Obvs that meant making my way downtown to see Ms. O and Mr. M. After the random wintry mix that we experienced that day, I voted for ordering in and loungin around inside. I was in the mood for Italian so when they suggested Harry's Italian, my face lit up. After reviewing the menu we made some excellent decisions and in no time Mr. M went to pick up our meal. I must say I'm impressed with their packaging because it makes take out photogenic. We started with the Calamari. Very well seasoned - not greasy and accompanied with a slightly tangy marinara sauce that blended perfectly. My mouth couldn't help but water when I saw the pizza. 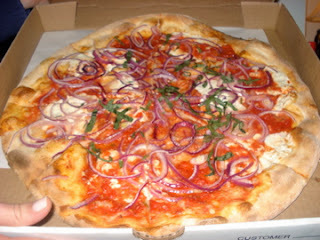 I know we ordered onion pizza but I guess I didn't think they would be red onions. They just looked. so. good! I inhaled a slice of pizza so I could make room for our pastas. 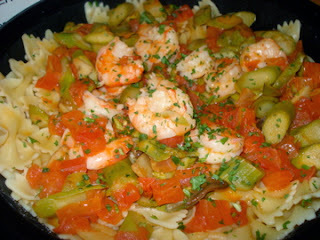 The Shrimp and Asparagus with Bowtie was an excellent choice by Ms. O. If there's shrimp involved I'm almost always happy :) The sauce was a little thin here but it was big on flavor. 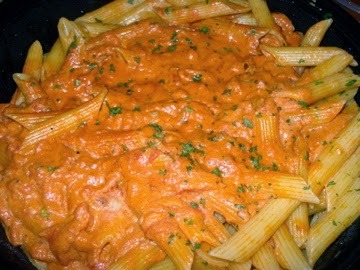 The Penne alla Vodka was incredible. We had them de-prosciutto-fy it first but it was still really good. Almost as good as Ms. O's. I was quite happy with our decision to stay in and indulge in some treats from Harry's. Eventually they also introduced me to Archer and now I can't wait to finish watching the first season! "Oh put it back in the deck"
@mso hehe happens to the best of us. @wildfiyah ready when you are! I have always loved dining in an italian restaurant. I love pizza and pasta and i find them to be the best comfort food. thanks for sharing.